Keep Toes Straight & Healthy - These gel toe straighteners help reduce rubbing and pressure between toes by keeping them properly aligned while moving. Soft, Flexible Comfort - Crafted with a silicone gel, these hammer toe straightener correctors are lightweight, stretchy and slip between digits with supportive comfort. Supportive, All-Day Relief - ZenToes hammer toe splints can be worn at night or during the day while wearing tennis shoes, heels, boots, and other footwear. 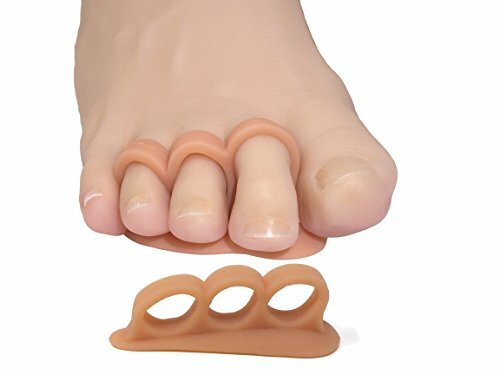 Universal Unisex Wear - Men and women alike can enjoy proper hammer toe treatment with these silicone gel splints that stretch to fit your personal foot size. Stain & Odor Resistant - These gel cushions are made with medical-grade silicone that provides proper orthopedic support while resisting stains, sweat and odor.